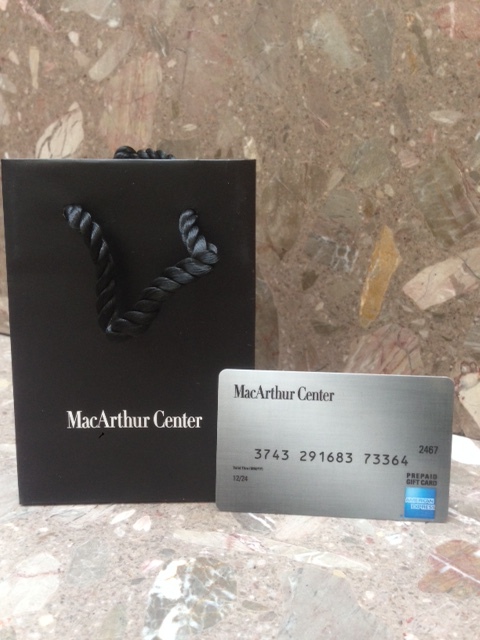 This post “Christmas Gifts for 25” is sponsored by MacArthur Center. All opinions are 100% mine. Shopping on a budget this year? Aren’t we all? Even when we are pinching pennies we don’t want to look like we are. Wonderful gifts don’t have to cost a lot- and they can even have special meaning without blowing the budget. 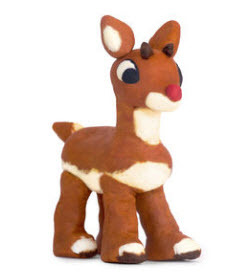 The other thing about gifts under $25 is that often it’s tough to get FREE shipping because we haven’t reached a minimum purchase. And NO ONE, frugal or not, likes to pay for shipping. So I ran down to MacArthur Center Mall in Norfolk, VA one afternoon with a mission- to find some Christmas Gifts under $25. I tried to find items for all ages and all types of people that still seemed thoughtful. When you have to buy for everyone from the boss to a kindergarten teacher a nice variety is what you need! 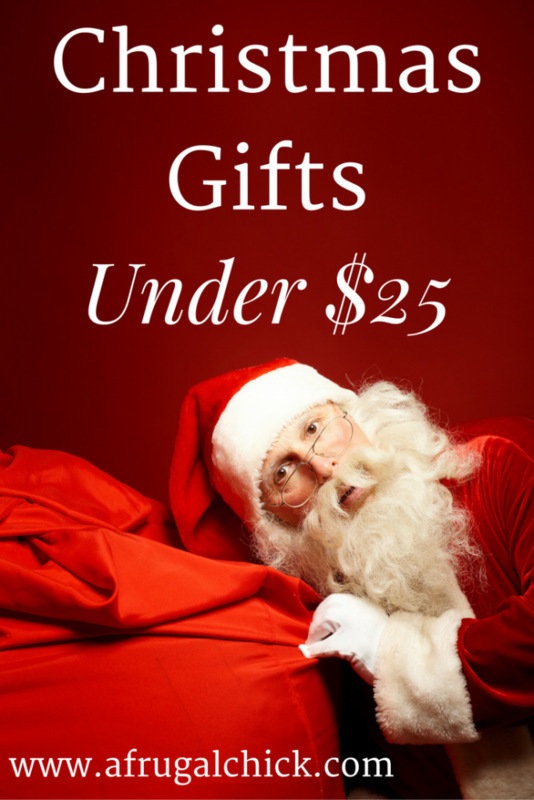 So now you can brighten up under your tree with these Christmas gifts under $25. I feel like coffee and tea drinkers are so easy to buy for. Travel mugs and small packages of their favorites can make anyone smile. I had a friend who worked carpool line at her school every morning. She never realized she always had coffee in her hand until she started getting gifts from her students for the holidays. She came home with like four travel mugs and tons of Starbucks gift card. 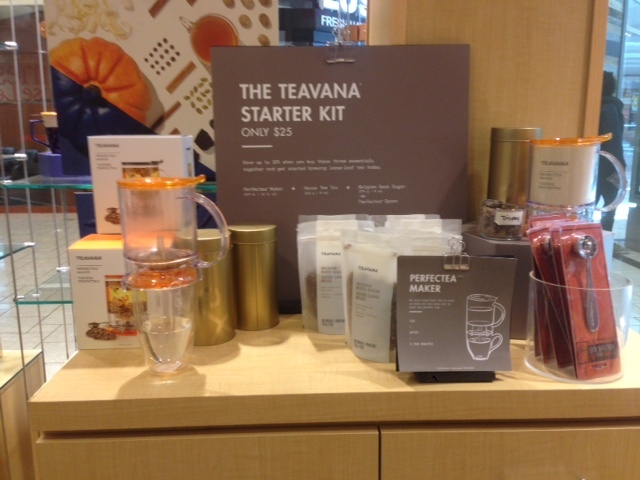 If you want to grab something a little more unique than a gift card I was thrilled to find this starter kit in Teavana for $25. It’s actually cheaper in the store than on their website! It includes a Teavana® 16 oz Perfect Tea Maker, 1 lb perfect rock sugar and a Gold Teavana Tea Tin to keep their tea fresh. They also have some nice tea variety boxes for about $20 so you could go the tea route instead of the tea maker. Be sure to ask them to show you the Tea Maker in the store- it’s how they brew all their tea! For the non-teetotaler in your life I looked for some other choices. Of course a bottle of their favorite spirit is always a classic. 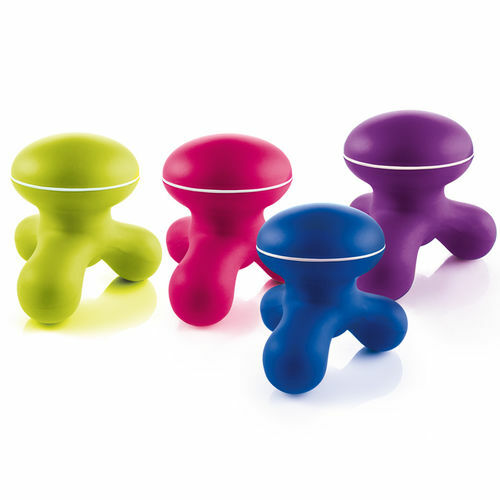 But there are so many options as well- cups, drink/bottle openers and ice cube options! Brookstone was a gold mine for alcohol related gifts under $25. Between wine, beer and scotch drinkers you have a big selection. The Perfect Girlfriend to Girlfriend Gift! I realize Christmas is after the normal “thankful” holiday but there is just something about having the tools to start a New Year with a grateful outlook. A set of Thank You cards or a nice journal can be a fantastic gift! I know every year I make a resolution to write more and a beautiful journal often makes me want to pick it up and (try to) fill it with deep insightful thoughts. No one has more beautiful paper products than Papyrus. Just being in the store fills me with a sense of organization and purpose! Like I’ve got my life together more than I actually do. They have hundreds of cards, calendars and journals to choose from. 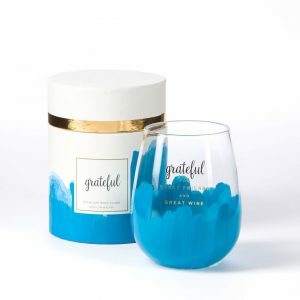 I fell completely in love with their gratitude collection. They have beautiful journals, candles and cards. But the item that caught my eye are these SUPER cute glasses (available in tons of colors). They say “grateful for great friends and wine.” And at $15 each they would be perfect for girlfriends who do small gifts for the holidays! Anyone who gives me a gift to make my life easier is automatically my friend. And while a bottle of wine will usually do the trick sometimes you are looking for something a little lower in calories. 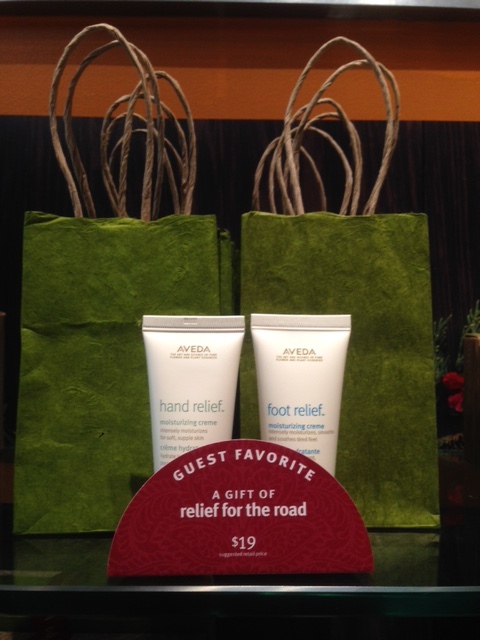 Hand and foot stress relief lotion are a best seller at Aveda. And for some reason they don’t sell the two pack on their website so it seems you can only grab this particular set in the store. I don’t know that I would want someone in the office to pull out their foot lotion during the day but the hand relief would certainly be nice to have in my desk! This would make a nice gift for a co-worker. If you want to go a little more high tech with your stress relief gifts you can check out these Buzz Personal Massagers at Brookstone. Actually Brookstone has a huge massage section with quite a few small items under $25 that would easily fit in a drawer. I have a weakness for gloves. I HATE being cold and keeping my hands warm can go a long way towards keeping me toasty (and also in a good mood). Friends over the years have learned this trick and I have quite a collection of gloves, scarves and hats. They also can be super cute for dressing up an outfit. If your gift receiver has a favorite color or is always wrapped in a blanket consider gloves or a scarf for the holidays. My favorites come from little boutique style stores so at MacArthur I ran into Francesca’s. I drool over their accessories every time I go in. Do you see those grey gloves with the bow on them? I put them on. They are magic. They feel like heaven on the inside. And they were under $25. E-mail me, I will give you my mailing address to send them to me. 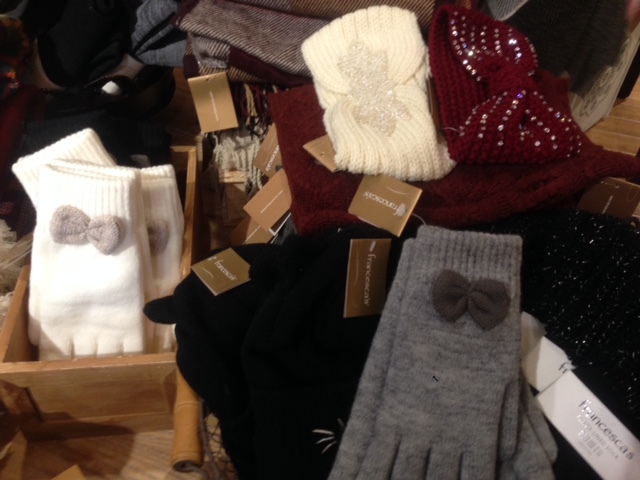 Francesca’s had tons of cute hats, gloves and scarves in all different styles and colors. If you are looking for something a bit more rugged head down to Eddie Bauer. 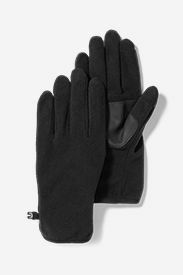 They had a nice selection of outdoor gloves as well. You know that friend. Their bathroom counters are covered in lotions, make up, scrubs, salts, masks and they always seem to be buying new things. Nothing makes them happier than opening a package with something else to make them feel pretty or relax (or both). One of the great things about these products is you can usually just walk in a store and go “do you guys have any gift packages for under $25?” and BOOM. Three appear in front of you already wrapped in cellophane and you just sign the card. And that’s exactly what happened when I walked in Lush. They put these adorable packages in front of me (and many more) already wrapped and ready to go. Some had bath bombs, some had shampoo, some had things I had never heard of. This little guy is soap! The staff in Lush is fantastic and all their items are cruelty free. Gifts for the Sweet Tooth! During the holidays there are sweets everywhere but many of them are just not quite the quality I want to waste my calories on. Now if you want to throw some homemade fudge my way we can have a conversation. 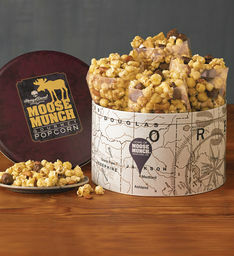 But my all time favorite store bought is Moose Munch from Harry & David. They have tons of sizes available to fit any budget. I have done these for Dirty Santa parties before and they are always fought over! If you happen to be in Harry & David you can grab soup mixes, hot chocolate, coffee and other cute little gifts easily under $25. Also if you are in a mall with a Harry & David stop in and see if they sell their amazing pears in singles. When we go to MacArthur Center we always stop by and grab one for dessert- it’s so good and has so many less calories than grabbing a ice cream somewhere! If you are looking for something a bit fancier you can head down to Williams-Sonoma. 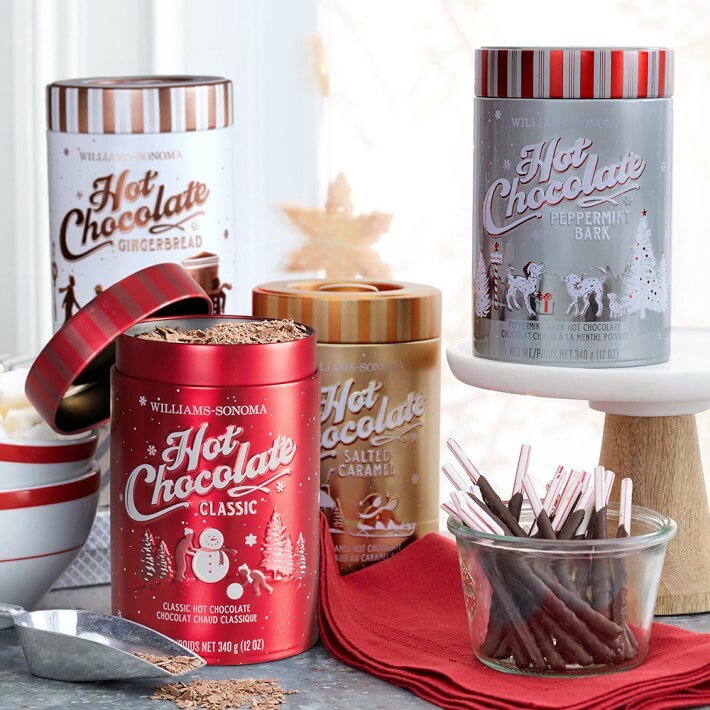 They have hot chocolate, peppermint bark, dipping oil, mulling spices and the most important thing … samples. The store smells like magic just when you walk in. I used to work in an office with 15 guys who all had to dress up for work every day. They wore the same khaki pants and company issued polo shirts. So what did they do to rebel a little bit? SOCKS. All kind of colors and designs. And you can grab great quality socks for FAR under $25. Plus putting on comfy socks can make the whole day seem a bit more fun- you look down and BAM- suddenly the guy in the suit has a personality. I found some nice quality socks in Johnston & Murphy. They were all save 20% when you buy 3 or more pairs and according to the employee that’s a pretty frequent sale for them. I saw prices that varied from around $10 to $20 so combined with the 20% off you can get a nice deal. Funny gifts can be tough purchase. I had a friend one year SO excited to give me my gift- a calendar of nuns dressed as clowns. I had no idea even how to react. Thankfully I think some of the proceeds went to a charity and the slightly terrifying nuns hung inside my pantry for a year before they were replaced with a complementary Williamsburg, VA calendar. Much more peaceful. Inside every good mall is THAT store. The one full of stuff you would never think of. Stuff that makes you chuckle. Clever stuff. Inside MacArthur Center that is their newest boutique store Mad Hatter Studio. I could have spent three hours in this store reading EVERYTHING. 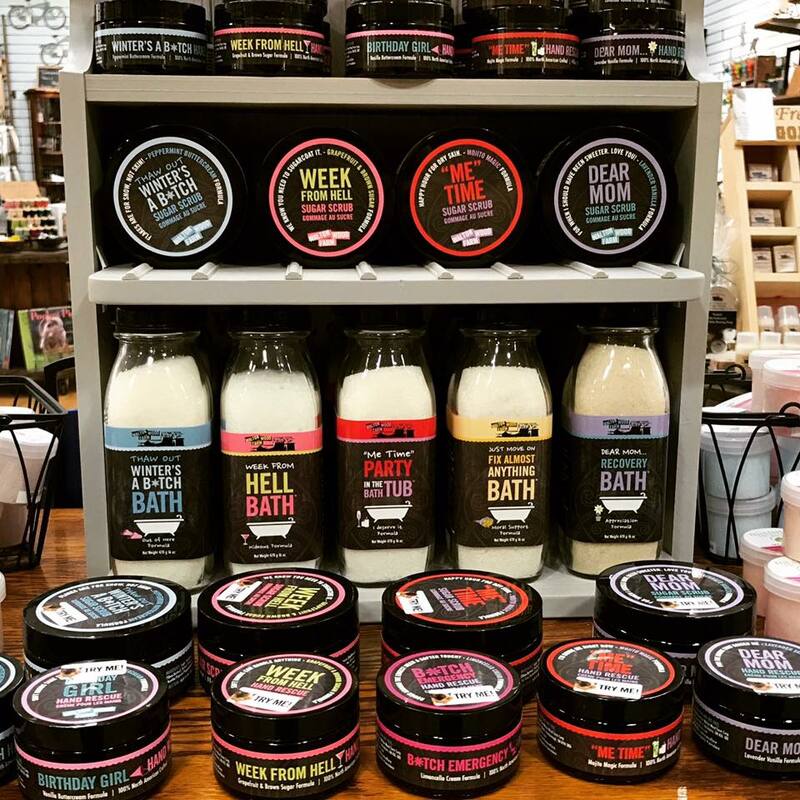 Yes that is “Week from H***” Bath Salts. 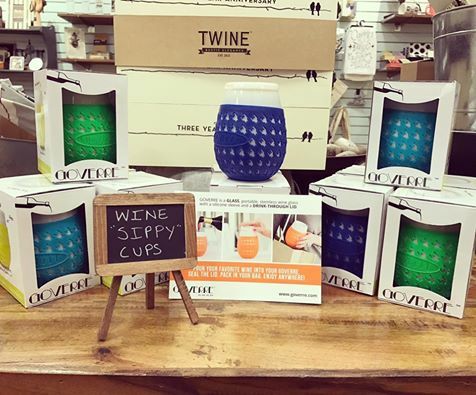 Wine sippy cups. So there are no more accidents. 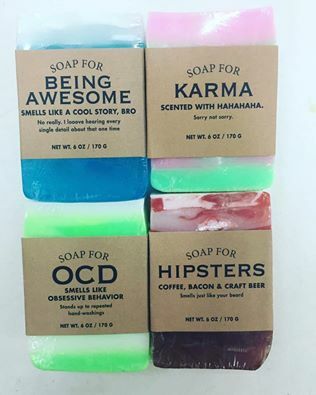 Yep, bacon soap people. BACON soap. 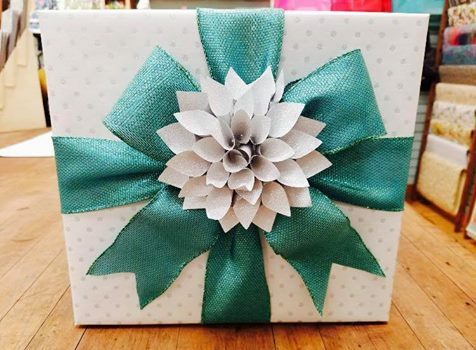 Not to mention they gift wrap like ART. When all else fails you can go to the old favorite- a gift card. Almost everyone has them now. 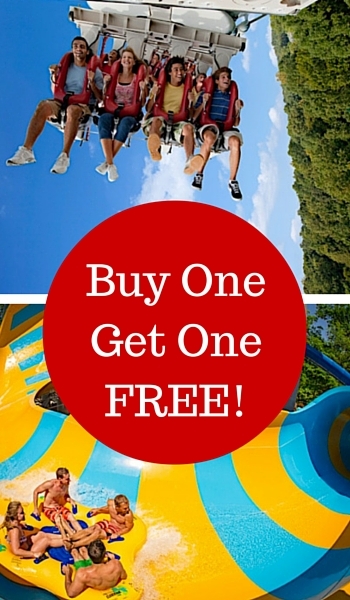 And if you happen to be at MacArthur Center for gift cards they are running a deal through November 30th! Buy 5 gift cards and get a FREE $15 California Pizza Kitchen voucher! 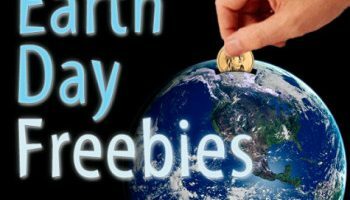 So you can grab your gift cards and then a free dinner! When you need Christmas Gifts under $25 you can take a few hours at your local mall and knock out all your shopping. 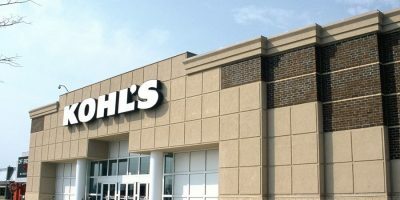 And if you happen to be at MacArthur Center be sure to sign up for their Oh, So Simple Rewards program and start getting credit toward your purchases. Plus through 11/14 you can enter to win a $100 MacArthur Center gift card from A Frugal Chick! 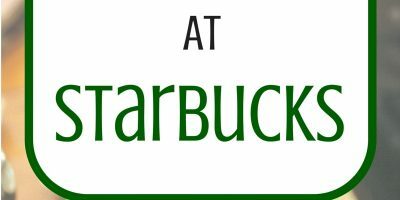 « Starbucks: Buy a Tumbler Get FREE Coffee or Tea All of January!